Roberta Pyx Sutherland is a visual artist living in Victoria BC. Her education includes a BFA from the University of Victoria, study at Emily Carr College of Art and Design, the University of Sheffield UK, Ikebana Ohara School, and residencies at the Banff Centre. Her teachers and mentors include Jack Wise, Roy Kiyooka, Don Jarvis and Jack Shadbolt. Since 1982, the artist has exhibited widely in Canada, Mexico, Europe and the US. The Canada Council for the Arts and Seagrams Art Collection hold her works. For the Metchosin International Summer School of the Arts, she mentored an Artist in Residence program. She is one of 50 artists featured in Canada’s Raincoast at Risk: Art for an Oil-Free Coast. Contemplative, spontaneous, experimental, and immersive. Devoted to mark making based on West Coast calligraphic traditions this course offers ways to integrate the timeless language of the brush into contemporary art practice. Mon-Thursday 9:30am - 2:30pm. Sundays 8am - noon. ​Sutherland exhibits new work during the Todos Santos Studio Tour. After driving through miles of dessert, the verdant growth here made an immediate and powerful impact. I am still amazed by the generosity of this aquifer and thrilled by a studio in a lush garden. 'Life at the Oasis', my new installation of contemporary water-colors, celebrates this abundance. For a number of years my work has concentrated on abstraction with zen ink techniques. These new pieces still record the endless and subtle possibilities of layered ink washes but now applied to cast shadows and ephemeral garden light. ​Roberta Pyx Sutherland exhibited new paintings June 30-July 10 2016 at the ARC Gallery on Hornby Island. Widening Circles, acrylic on panel, 20x20 in, 2016. ​Below: Roberta’s three-person exhibition titled Hommage ran May 5-14 2016 at Galerie Espace, 4844 Boulevard, Saint Laurent, Montreal. For this exhibition, Roberta made a series of body-size scrolls. Hommage includes the concept of honouring or paying respect. In Three-in-a-Row the artist presents a trio of life size collages that work as scrolls. The collaged elements include handmade Japanese papers printed in a variety of methods including monotype, collagraphs and lithography. Three-in-a-Row by Roberta Sutherland, collaged pieces of handmade papers, ink, 2016. Roberta installing three-person exhibition titled Hommage at Galerie Espace, May, 2016. Below: Sutherland joined with abstract painter Wendy Skog for a two-person show in the mansion at Art Gallery of Greater Victoria, March 26-May 6 2015. “The pieces are an ongoing conversation,” she says, “and the most rewarding one to date!” The recently completed works spotlight the dramatic energy and myriad forms emerging from Sutherland’s ongoing investigation of imagery related to the simple dot. 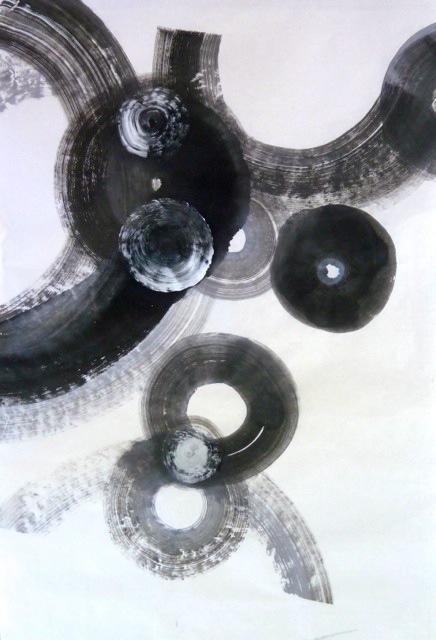 The new work connects her Zen study of the calligraphic circle to the theories of quantum physics. The artist’s vital and elegant images offer much for the viewer to contemplate. 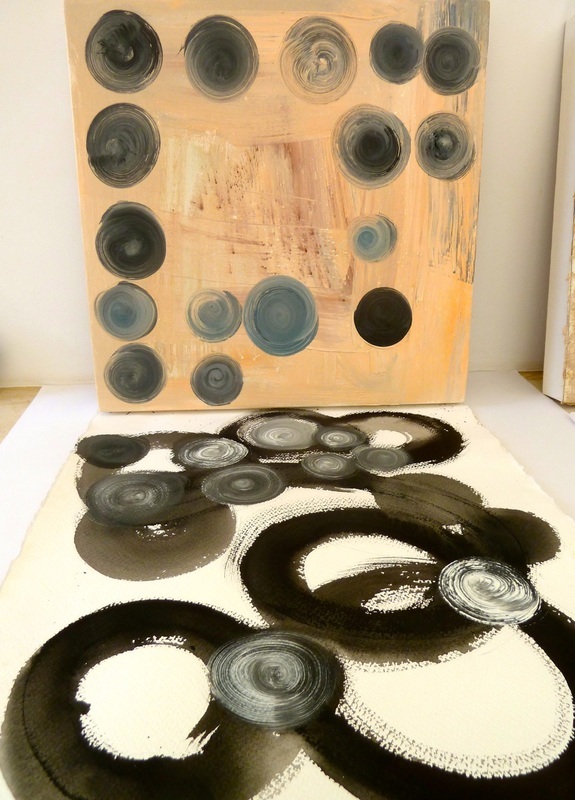 In 2012, Sutherland’s residency at the BAU institute launched her exploration of dots and circles. Entrance to the Castle in Otranto, Italy. In June of 2012, Roberta Pyx Sutherland arrived at the BAU Institute in Otranto Italy, for a one month artist residency. The residency houses 12 artists of various disciplines in a medieval castle, inside a walled city, next to the Adriatic Sea. Sutherland’s studio was a small cell-like room, with high-coved ceilings. Sitting at her desk, looking out the open doorway, the artist viewed ancient walkways and fortified walls. In this place and time, Sutherland launched herself on a transformative journey. Using the only art materials at hand, she picked up a brush, dipped it in ink and began to make a series of dots on hand-made paper. She found the process meditative and engrossing, time flowed by and the dots grew in number, one artwork leading to another. When people arrived to talk, or her arm to tire, the dots began to waver, responding to her changes of energy and focus. Point, line and plane combined in these new works to make intriguing compositions. Paola Iacucci, a director at the BAU Institute, praised the new paintings in 2012: “Sutherland exercises a light touch that resonates with human understanding and depth of awareness.” The spaces between the dots are alive with possibilities, she notes, and address themes of connection and separation in our lives. Each year, Gallery Editart in Geneva commissions an original print series for their “Circle of Friends” collectors. In 2012, this honour was awarded to Sutherland. During May she worked with renowned printmaker Masafumi Yamamoto in Barcelona. The resulting print Chrysalide (Chrysalis) was christened at Gallery Editart’s annual fall exhibition in Geneva. The exhibition’s colour catalogue contains Chrysalide, as well as 50 artworks by Sutherland spanning the past three decades. Inspired by Sutherland’s print, Swiss poet and dramatist Sylviane Dupuis added her poem to the Chrysalide catalogue. “Chrysalide” artists proof, intaglio with chine-colle, 20 x 20 cm, 2012. Sutherland’s art career spans over three decades and many series: ranging from richly textured Buddhist images to gestural charcoal and ink drawings. During her wilderness wanderings in British Columbia and Spain, she documented landscape through careful contemplation and intuitive mark-making. The influence of Zen practice, which focuses the mind to unify breath and brush, gives a spontaneous freedom to her work. Confident and alert, she captures the flow and energy of mountain vistas and the map-like meanderings of hills, lakes and rivers. “LandMarks” found materials with graphite and acrylic, 77 x 80 cm, 1986. “Primavera” watercolour and ink on rag paper, 30 x 38 cm, 2008. Sutherland moves from literal to experiential in the latest work, saying “in some way, I look to chart the inexpressible.” Theories of quantum physics inform her work. A circle appears simple and perfect, but has a mysterious quality: the circumference can be assumed, but never accurately measured. “God is a circle whose centre is everywhere and whose perimeter is nowhere,” stated Voltaire. Plato postulated that shapes like the circle exist as perfected archetypes, in our struggles to replicate them in physical reality, we take part in a sacred act. “The Majesty of the World is Always There” says her teacher, Chogyam Trunga in his book True Perception. Sutherland seeks this glorious totality through the singular dot, a gateway into complex patterns, realities and relationships. “Game under Way” ink on handmade paper, 75 x 100 cm, 2013. “Harmonic Field” ink with acrylic on canvas, 130 x 90 cm, 2013. “Open Field” ink on handmade paper, 80 x 66 cm, 2013. “Urban Strategies” (detail) ink and acrylic on canvas, 130 x 90 cm, 2013. “Urban Strategies” ink and acrylic on canvas, 130 x 90 cm, 2013. ​​Roberta Pyx Sutherland welcomes your interest in her studio & artwork. ​from the University of Victoria. 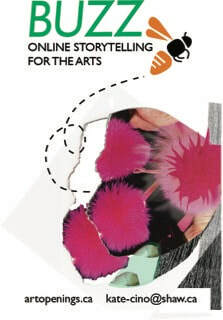 ​This website and its content is copyright of Art Openings, 2009.